Last week was a really busy week. Good, but busy. One of the things that went on last week was a baby shower. Yay, babies! So, of course, I had to make something. 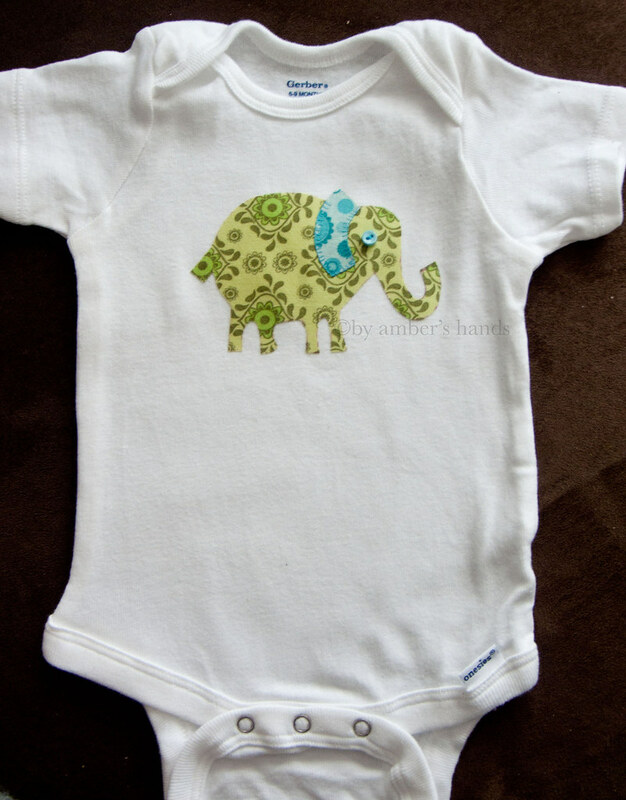 The parents have decided to wait until the baby is born to find out its gender, so I had to keep the onesie neutral. Their registry looked like they were going for a jungle theme for the nursery, so we put a gift together to match. One thing we got for them was a crib sheet that had a green elephant with a blue ear, and it was the perfect addition to the otherwise lion & giraffe-heavy gift. 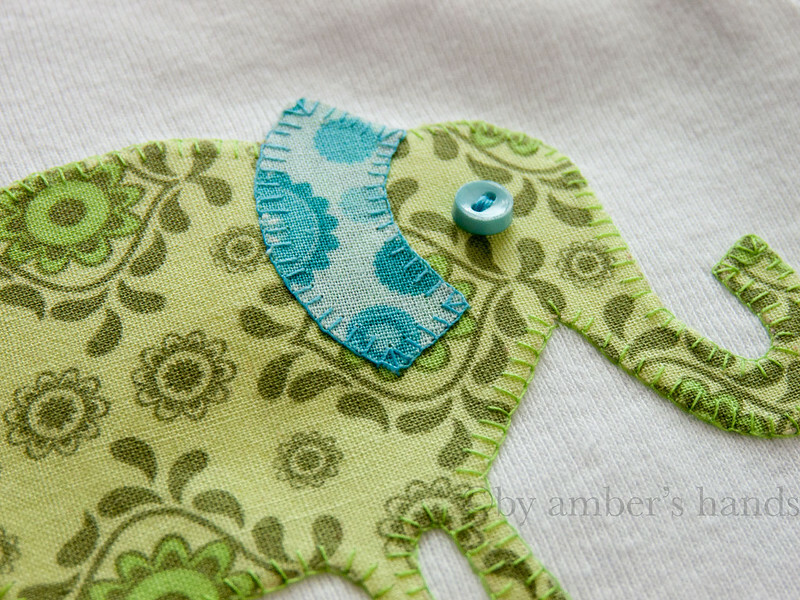 It’s funny, because I was already planning to make an elephant shirt for the other big event last week, so I ended up making 2 elephants, but they’re very different. More on that one later. 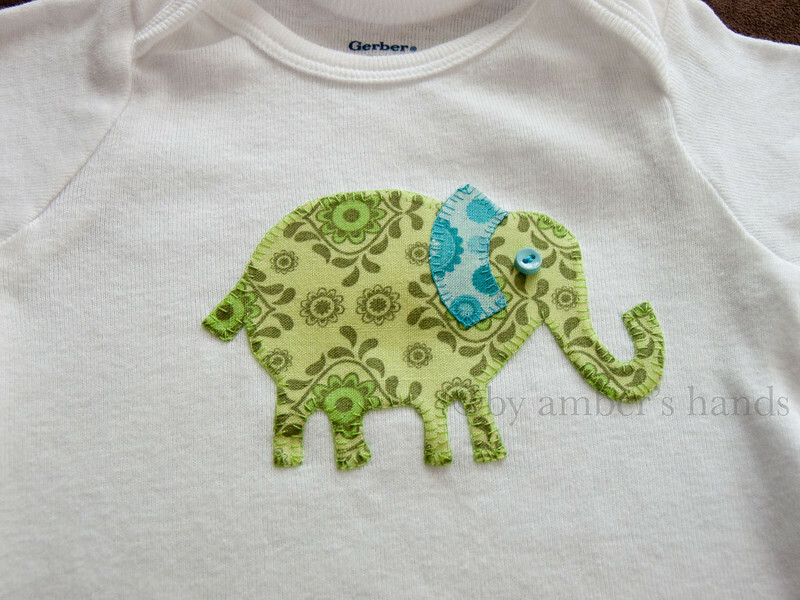 I had made an elephant onesie a few years ago for my friend’s newborn, and so I already had the pattern. 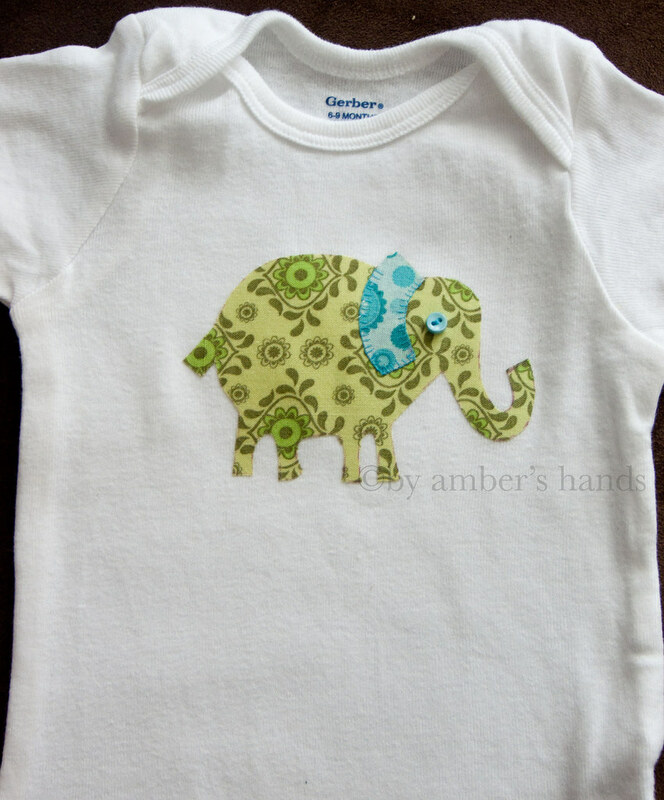 Since that part was out of the way, I think this onesie took me less than 2 hours total from start to finish. First, I used Heatn’ Bond (my interfacing of choice) on the wrong side of the 2 fabrics I was using. Since I make these fairly often, I usually put Heatn’ Bond on a large part of whatever fabric at a time so I don’t have to do it every time. I traced the pattern onto the fabric with a disappearing fabric marker and cut it out. I left the paper on the back of the green paper, then bonded the blue to the green and hand-stitched it with a blanket stitch before putting the whole thing on the onesie. (Note: Make sure to take the backing paper off AFTER ironing and BEFORE stitching. Otherwise you’ll either bond the whole thing to your ironing board, or you’ll have a terrible time getting the paper off after stitching it!) I also sewed the button eye at this point. It’s not really necessary to do it like this– you can bond it all to the onesie first and stitch it all then, but I find it easier to sew through the least number of layers possible. I also think it gives the button a little extra holding power to have the stitches bonded in between two layers of fabric. I also knot off the button stitches a few times to give it a better chance of staying on in case the thread gets damaged somewhere. I figure when we’re talking about a little button on a baby’s shirt, it’s important to keep it as secure as possible! Then I bonded it to the onesie. I like to position it fairly near to the top of the onesie. You can see that the disappearing ink gets a little darker right after ironing, but I’ve never had a problem with it sticking around. On the off-chance you find that it doesn’t disappear when you want it to, you can use a damp cloth to rub it off a bit. The ink reacts to the humidity in the air, so depending on the weather it will disappear faster or slower. 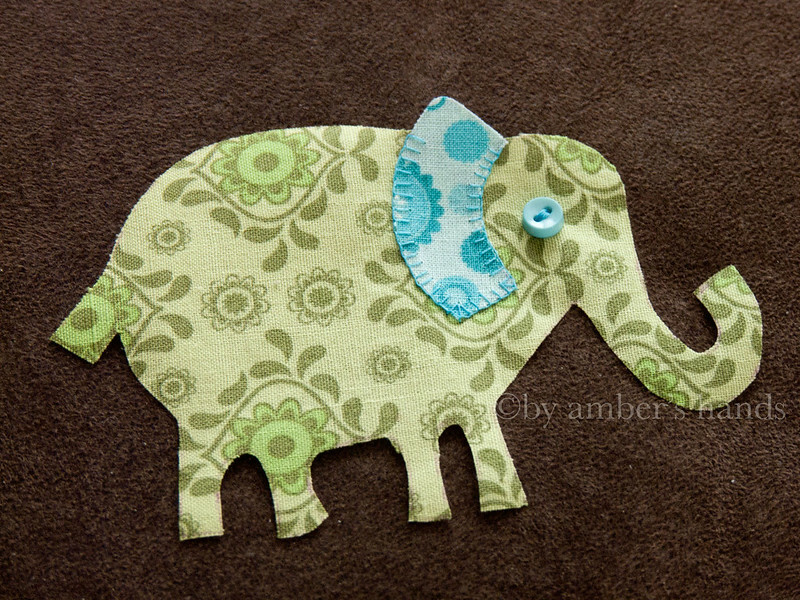 Then I blanket stitched all the way around the elephant. If you notice in the pictures earlier, I didn’t stitch the very top of the ear until I put it on the onesie. 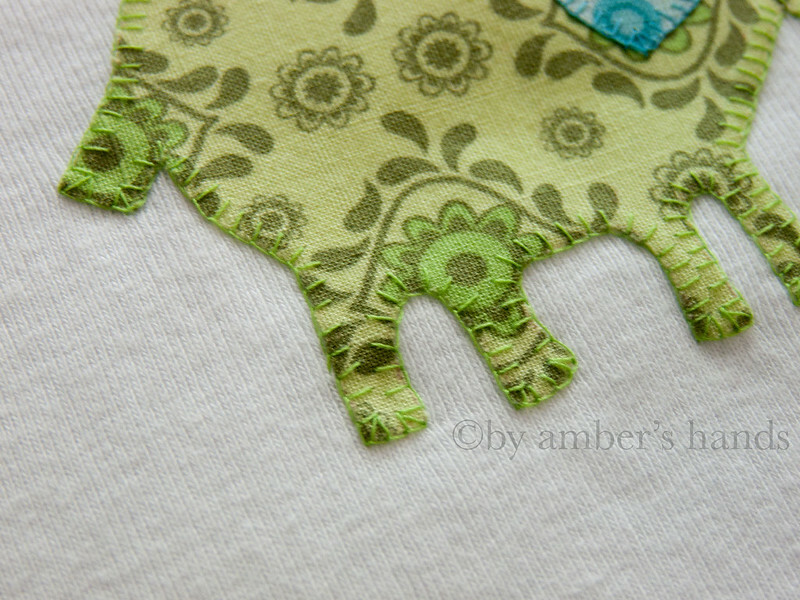 I used a bright green thread for the elephant because I liked the contrast. I find that when I work with so many different colors/patterns of fabric, it’s not feasible to buy thread that exactly matches each one. I have a large stash of thread, and buy more if I don’t have one that works, but I generally like a little contrast in the stitching for interest’s sake. WordPress spell-check’s ridiculous questions of the day: “knot: did you mean ‘not’?” and “weather: did you mean ‘whether’?” No. No. No. Also, isn’t “cutie” a widely-used and recognized word? C’mon spell-check. Get with it.